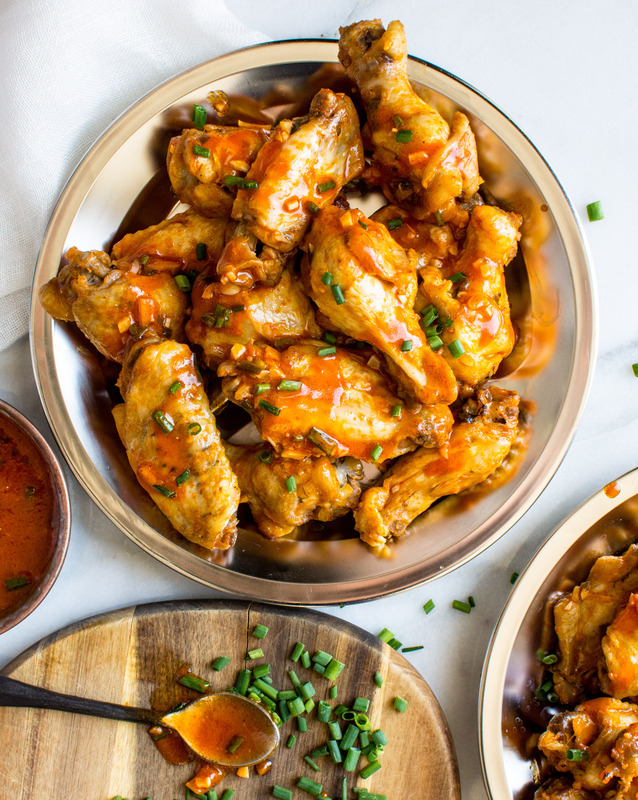 Author note: This recipe includes two ways to cook the wings: traditional or with the Instant Pot. This Instant Pot version of the recipe can also be found on the Sur la Table website (click here to find the recipe). If you would like to grill the wings, click here. Fill a sauce pan with an inch of water. Bring to a boil, and reduce to a simmer. Place a silicone steamer basket into the pan. Fill the steamer basket with the drumettes. Place the lid onto the sauce pan. Steam for 10-15 minutes, or until the chicken has reached 165 degrees. Line a rimmed baking sheet with paper towels. Place the wings on top of paper towels and place into the fridge for 1 to 2 hours. Heat an oven to 425 degrees. Place 3 tablespoons of buffalo ranch sauce into a large mixing bowl. Place the chilled wings into the mixing bowl and toss to coat. If the wings appear to be dry, add a few more tablespoons of buffalo ranch sauce. Place the tossed wings on to a rimmed baking sheet and place in the oven. Cook for 10 minutes, or until the outside of the wings are crispy. Meanwhile add 3 to 4 additional tablespoons of buffalo ranch sauce into the same mixing bowl. Set aside. Remove the wings from the oven, and place back in to the mixing bowl. Toss to coat well. Serve warm topped with chopped fresh chives. 30 minutes before cook time, remove the wings from the fridge and evenly salt the wings on all sides. Let the wings sit at room temperature for 30 minutes. Pour the water into the Instant Pot and place silicone steamer into the Instant Pot insert. Using the steam function, steam the wings on high-pressure for 10 minutes. Use the quick pressure release method to release the steam after 10 minutes of cooking. Place the hot sauce, butter, honey and salt into a small sauce pan. Cook over medium high heat and bring to a boil. Reduce to a simmer and let simmer for 5 to 8 minutes, or until the sauce has thickened. Remove the sauce from heat and add the shallots, chives, garlic and buttermilk. Stir well. Serve warm or at room temperature. This entry was tagged A Pleasant Little Kitchen hot wings recipe., buffalo ranch hot wings, buffalo ranch wings, dallas food blog, dallas food blogger, how to make hot wings in an instant pot, Instant Pot hot wings, pressure cooker hot wings, texas food blog, texas food blogger. Bookmark the permalink.